As the curtain falls on August, this month may go down in our history as our busiest month so far. A combination of the steam engine on the first and last weekends and the visiting Class 26 seems to have been a winner. Said visiting Class 26 unfortunately disgraced itself this morning and was unable to operate the first return because of a fractured pipe on the turbo but our fitters were on the case and it was repaired and back in service by the 12:15, much to the delight of our regular enthusiasts and of course, the owning group. Work continued on the CK coach in the shed and it is pleasing also to see a nice early flurry of Santa Experience bookings too! Rob was having trouble sending the report so he has asked me to send it. Today we hosted the final day of our bank holiday 1950s event, and what a fantastic event it has been with wall to wall sunshine throughout the weekend and very good passenger numbers. A big thankyou to the train crews, the catering team, the signalmen and shottle, the booking office staff and everyone else for making it all happen we coudnt do it without you. And also a special mention and big thanks must go to June and Barry cook who have spent alot of time organising the event and putting all the 1950s memorbelia display together in the marquee on platform 1 which was a fantastic display and very popular with the public. Today we had two train running as well with the Jinty 3F and the class 26 running the Duffield services. This is the first time we have had two visiting locos running together on the two train timetable, and the first time we have run Diesel loco and Steam together as well. Sadly today was the last day of steam on the Duffield service for this year and the 3F Jinty running with us before she heads back to base at the Great Central Railway what a fantastic loco it has been during its stay and very reliable performer. Down the yard work continued on the RF stripping out the interior woodwork and trim in the north end. In the shed Faraday had its air tank and other various components painted up in anti corosive primer and the axle box was steam cleaned before it is refitted. Also welding and painting continued on the p way bubble. 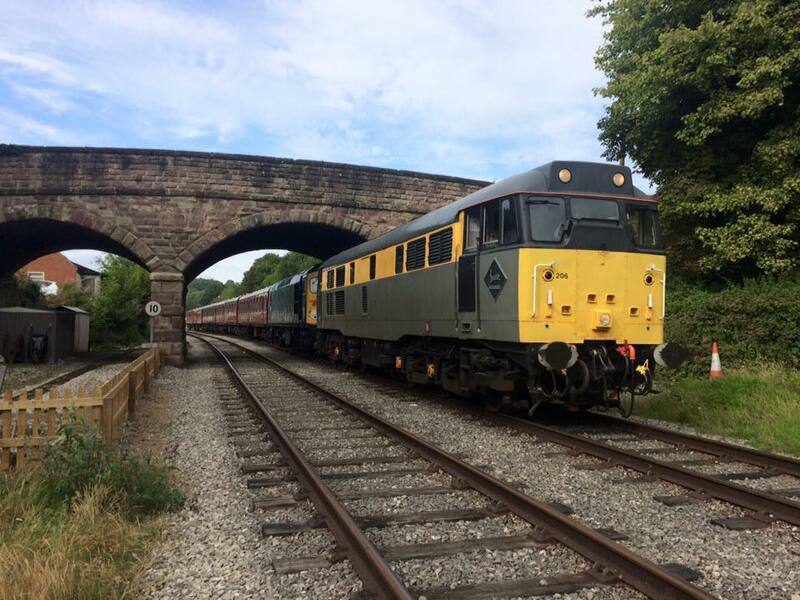 And to finish off I attach a lovely picture below taken by Oliver Hogkinson at Shottle of the Jinty passing the class 26. Better weather these last two days has enabled good progress on many fronts. Firstly, the lads arrived early yesterday to put the coach rake back together again following the previous day's photo charter with the Jinty. This had to be done early as they were out again in passenger service at 10:20. The trains on Thursday were very good for mid-week, outdoing Tuesday as well. This was partly helped by a coach party from Lincolnshire who took a ride and enjoyed a buffet in the Pullman afterwards. The Maintenance Team turned their attention to 51188 which had a faulty starter on No.2 engine and a blowing injector on No.1 engine. Tackling the starter motor first, they rectified this fault, before moving on the injector. It seemed a good clean would sort it out, making the vehicle fit for tomorrow evening's Murder Mystery. Unfortunately though, during the coach shunting in the morning, the Class 31 expired with a traction motor blower fault. Luckily there wasn't any damage done and the rapid response from Northamptonshire arrived today and cleaned it all up and got it fit for service. The Class 26 which is visiting from the Gloucestershire and Warwickshire Railway has been running all of the services recently as we wanted to get good use out of it whilst it was here. It seems it hasn't been a waste as it has been popular with enthusiasts. I have seen some of them here for 7 running days in a row!!! I hope they're not disappointed on the last train today as we decided to pull a stunt for them and put the Class 31 double-heading the 26 on the last train as a test for the repairs done to it during the day. Today we hosted an additional round of afternoon tea's as well because the Tuesday services have been so full we couldn't process all of the customers wishing to enjoy the experience. So we now fling ourselves into the Bank Holiday weekend and I can't believe it is the end of our steam services to Duffield on Monday. As a final hurrah, we'll be two-train running on Monday with the Class 26 running alongside the Jinty. I think it will be the first time ever a steam loco service and a diesel loco service will have passed each other in the history of the line. It is also the 1950s Weekend so come along and take in the atmosphere because the weather looks good! Another day with the visiting Class 26 with a boost from a coach party who were treated to Afternoon Tea in the Pullman before taking a train ride. Down the yard, work continued on the RF kitchen car where some needle gunning took place. Over on the Derby Lightweight power car, the recently rebuilt air system had some leak finding done. Behind it, Faraday had the cab windows removed for refurbishment. Today is a milestone because we received our first Santa booking of the season! The quietest day of the week so far for our Class 26 running but still on a par with last Friday so not too bad really. Down the yard, the exam continued with 55006 and the Station's Team cleared out all old rubbish from the south weighbridge. Today's pic was taken yesterday actually by the driver at the end of the day. When I woke up this morning I wouldn't have given today a chance with the weather being dreadful! But, it soon became sunny and warm. Another busy day on the trains with two coach parties also helping proceedings. Passenger numbers were double last Thursday. Down the yard, FTR exams were done on the wagon fleet for the Jinty photo charter next week and some testing was done on the incline which required the Class 33. With the 26, running on Duffield it turned in to a Sulzer sort of day! Thanks to the catering team who have just recovered from our busiest weekend ever. They sold out again today !! Another fantastic day in the valley with our visiting diesel Class 26 D5343 as well as 31206 and 33103. Gala Sundays are traditionally quieter than the Saturday and today was the same but not that much quieter! We have just had the busiest weekend we have ever had! A huge thank you to all the volunteers for crewing the trains, manning the Booking Offices and even doing the on board bar which was busy all weekend. Over the last few years we have become quite good at estimating demand and managing the capacity we have on our trains. This isn't so important with a rake of coaches because that is pretty much fixed, but with DMUs we have the luxury of choice between single, two car, three car or anything we want really up to 9 cars. Mid-week services don't tend to have the demand that weekend services do, particularly when we have a visiting steam or diesel engine and so we tend to use either a single or two car DMU. They've been busy but fine just recently, but today we only just got away with it. It's a great problem to have to be honest, but it was too close to comfort with all 52 seats on Iris full on the first train today. That said, nobody was standing so you could argue that it was skill (but probably not). Down the yard, there was plenty of preparation for the special event weekend this weekend. The visiting Class 26 was properly checked over and coupled with 33103 ready for the double header up the incline in the morning. Sadly the multiple working isn't operational otherwise that would have been extra fun. The Class 31 had an amps gauge changed in one cab and it was positioned ready for the morning. The three car set had the final drives isolated and was positioned as it is being used as a second rake of coaches this weekend. Elsewhere, the Bubble's B exam continued with a fuel filter change on the engines. > Finally a sunny day! A reasonable day on the trains today where Iris was only just big enough. There were four seats left to be had on the first train from Duffield at 12:10. This is very pleasing for a midweek day. > I guess the big news of today is that we welcomed this summer's gala visitor in the form of Class 26 D5343 from the Gloucestershire and Warwickshire Railway. The locomotive is with us for three weeks which will see good amounts of running, starting with this weekend's gala. The locomotive was started and taken on a short test run up the hill to Ravenstor. > Elsewhere, further work took place on the electrical problems of the two car DMU set. It seems one of the starter motors on the 119 was down to earth, so this has been removed. A B exam is underway on the Bubble too so this continued in the background. Barclay No 3 received a washout. Work continued on Cathryn forcing the smokebox to fit by altering the sacrificial plates. Many of the tapered pins on Cathryn are non standard so there has been much reaming of the holes and beautifully turned tapered pins made by Stewart. A sunny day in the valley with another busy day on the trains. Two parties today and credit to the Catering Dept for having a really busy day on top of their efforts last night. It was the last day of the Jinty for a few weeks as our Diesel Weekend looms. Work continued in the RF kitchen car down the yard and the electrical investigations on the two car DMU. Quite a busy day on the trains today, busier than Tuesday in fact which is unusual. All three trains had good loads for a weekday and it was pleasing to see plenty of people doing single journeys after walking the Ecclesbourne Way. We welcomed a test customer today who performed a 1530 certification on their rail grinder. The Maintenance Team shunted the coaching stock around ready for a large dining party on the train this Saturday evening before going on to fit the throttle motor boxes to the PW Bubble. Speaking of the PW team, they were out in force down the line continuing with their quest to maintain the track. Our Bombardier apprentices being on works holiday have been refurbishing parts for the Derby Lightweight and doors for for the PWay Bubble.